Nominations are open for the National Car Club Awards - what better time of year is there to take stock of everything S2KUK has achieved during the last 12 months. Which of the club’s achievements or club personalities do you feel deserve special recognition this year ? Presented in association with Tourism Ireland, supported by Classic Car Weekly and endorsed by the Federation of British Historic Vehicle Clubs, the National Car Club Awards celebrate, recognise and honour the achievements of the nation’s car clubs, the enthusiastic people who run them and the remarkable cars they preserve and cherish. The 2019 NCCA dinner and presentation will be taking place on Saturday 23 March 2019, alongside the Practical Classics Classic Car and Restoration Show, with Discovery at the NEC, Birmingham. There is an award for every aspect of our club. We know that the deadline is tight but nominations are invited until Wednesday 23rd January for the panel of expert judges to consider. Please visit Classic Car & Restoration Show | National Car Club Awards to find out more. Shortlisted clubs in each category will be announced mid-February. 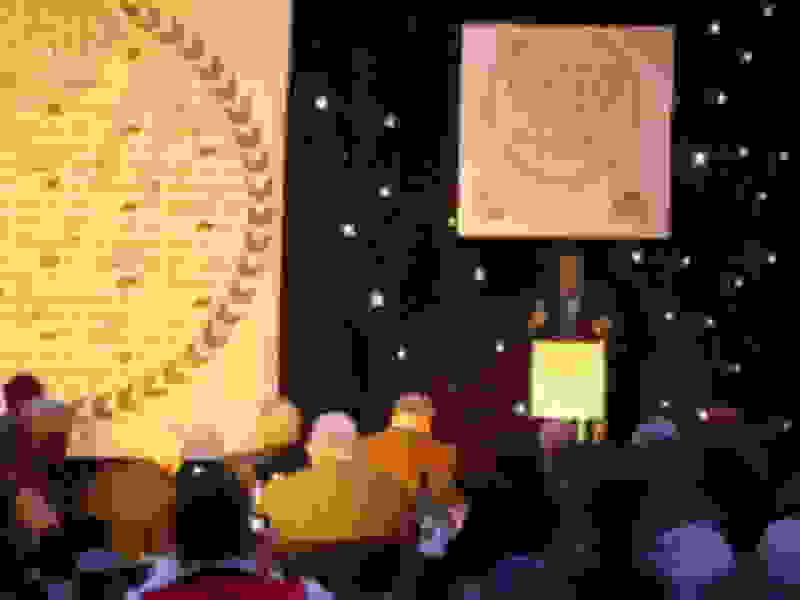 Two representatives from each shortlisted club will be invited, as guests, to attend the National Car Club Awards Dinner on Saturday 23rd March 2019, taking place alongside the Practical Classics Classic Car & Restoration Show, with Discovery at the NEC Birmingham. Enjoy a drinks reception and three-course dinner with fellow clubs, the perfect opportunity for celebrating, networking and sharing ideas. Then join in the celebrations as award winners are revealed by the celebrity host! 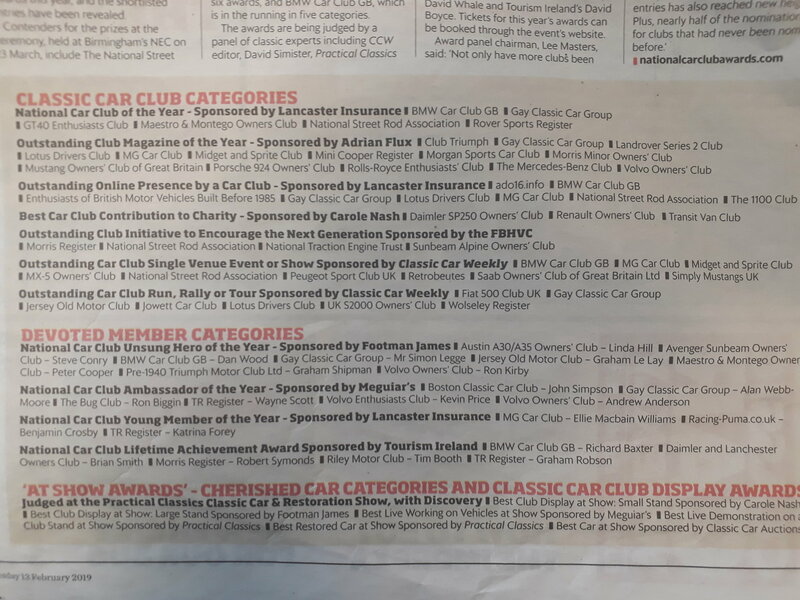 18 awards will be presented at the National Car Club Awards Dinner, 11 of which are open for public nomination: seven in the Classic Car Club category and four in the Devoted Member category. There is an award for every aspect of the club. Read the judging criteria in the leaflet to decide which is most relevant for the club’s achievement or club personality that you feel deserves recognition this year. Please do not nominate the same activity or person in more than one category. Nominations must be submitted online. There is a structured nomination process to assists the judges in their deliberations and several open questions with limited word-counts are asked within each. It is recommended you download the relevant award’s questions from the website and prepare your responses in advance. The club will happily assist with this where we can - just PM Andy2000 with what you need. Anyone is welcome to complete a nomination but they will be asked to confirm they have gained authorisation from S2KUK. This is to ensure that we are aware of all the club’s nominations. So please let us know if you submit a nomination directly. We'll be a little more ready for this one next year so you have a lot more time to prepare your nominations ! 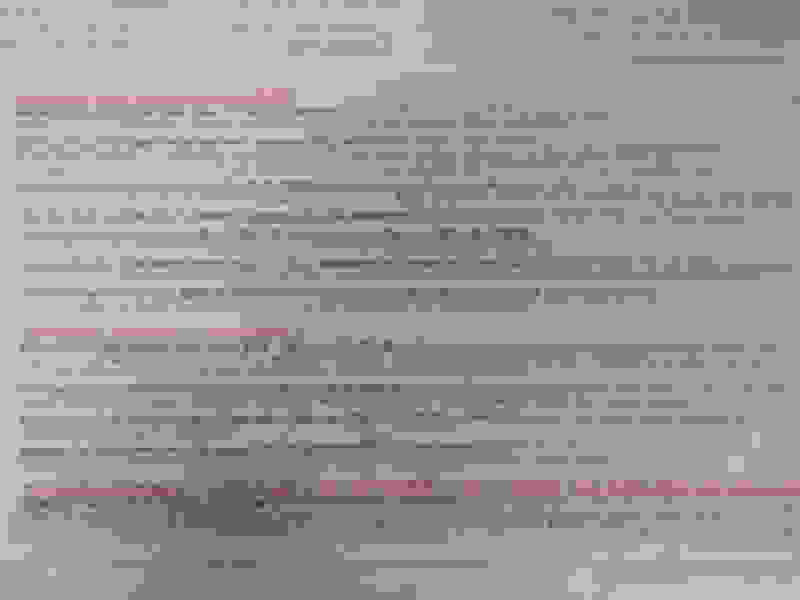 Last edited by andy2000; 01-19-2019 at 08:41 AM. We also get a mention in this weeks Classic Car Weekly if we win we can hopefully get a much more detailed article. S2KUK was at the National Car Club Awards ceremony on Saturday evening. Although we didn't win in our category it was a huge achievement to have got this far. The event was hosted by Mike Brewer and there was even an appearance from Fuzz Townshend (Car SOS) who presented a couple of awards. As a firmly established classic car club now, we intend to participate in more of these events. The next one being the Classic and Sportscar Show at the NEC in November where S2KUK will have a stand. Being nominated for these awards is down to the hard work and commitment from our members so thanks to everyone for making this possible. Apologies for the quality of the photo below, that is Mike Brewer ! I'll post more about the nominations for the November show later in the year. Last edited by andy2000; 03-29-2019 at 02:13 AM. What makes a successful car club? Considering buying an S2000 from Gloucestershire. Anyone from there?